Disney and Lucasfilm just announced Star Wars: Forces of Destiny, a series of animated shorts showcasing heroic women from a galaxy far, far away. Hasbro compliments the shorts with a lovely line of 11-inch “Adventure Figures.” It’s okay to say dolls. They’re very nice dolls. What an awesome face. In fact, the entire line features some pretty amazing stylized plastic heads. Check out Rey’s freckles. And this is the face of a character willing to risk it all to recover the Death Star plans. The next pairing just makes me sad on so many levels. Leia and Chewbacca would have made such a great team in a post-Han universe. And look at the detail on those costumes. Leia’s wrist things and upper arm padding, the stitching on her vest. Hasbro’s got some pretty amazing tiny tailors on the payroll. Note that Chewbacca isn’t the only male character planned for the series, with a Kylo Ren also in the works. I bet his hair will be amazing. And full-on fledgling Jedi badass Rey, shown here with her little droid friend. 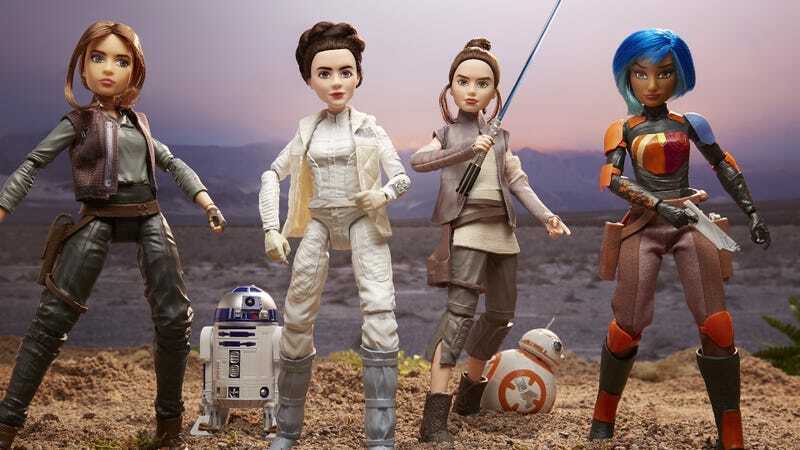 The Star Wars: Forces of Destiny doll line will hit stores on August 1, alongside role-play accessories like Rey’s extendable staff and a new electronic Jedi Power Lightsaber, both part of the Bladebuilders system. Dolls. Dolls. Dolls. I will buy all the dolls.